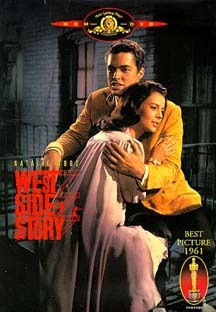 West Side Story is a modern, 1961 revision of Romeo and Juliet, and takes place in a rough neighborhood in New York City. Two rival gangs, the Jets, and the Puerto Rican Sharks are fighting over territory. One of the founding members of the Jets, Tony (Richard Beymer), who really isn't interested in the gang as a family anymore, meets Maria (Natalie Wood), who happens to be the younger sister of the Shark's leader, Bernardo (George Chakiris). They fall in love, over the objections of the rival gangs, with tragic results. George Chakiris, as Bernardo , won the Best Supporting Actor award. Rita Moreno, as Bernardo's girlfriend, Anita, won the Best Supporting Actress award. This musical has everything that a great musical should have: a powerful story, a great cast, dynamite music, fantastic dancing sequences, great transitions, great direction, great photography and great ensemble and individual work. All these terrific attributes more than make up for it's 1960's pacing, which, in the middle of the film, is slower than the popular standard set by the fast-paced "Star Wars" style editing. This musical holds up extremely well do to a variety of factors. What is really fantastic is the excellent musical score, and musical numbers, that were both created by the master, Leonard Bernstein, who in his earlier years was composing symphonies, and concert pieces for the classical music genre. Through the songs, the story is told in an entertaining way, and connects the plot developments without a hitch, giving the movie a flowing pace. 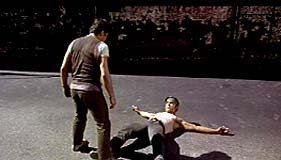 The Jets' opening song, "When You're a Jet" tells the joys and privileges of belonging to a gang, many of which today's gang members would agree. "America" expresses the views of the Puerto Ricans. Some of the songs expressing the love of Tony and Maria, are "Tonight," "Maria," "I Feel Pretty," and "Somewhere." It's no wonder that Bernstein won an Oscar for best musical score. If you enjoyed WEST SIDE STORY you may like "Cabaret," "L.A. Confidential," "Bound By Honor," "American Me," "Goodfellas," "The Godfather," "Romeo and Juliet," and/or "Shakespeare In Love."